A durometer gauge or durometer tester is needed to perform a durometer hardness test procedure. Durometer devices determine the surface hardness of many different materials, including polymers and elastomers. Each durometer or hardness tester measures the depth of an indentation in the material caused by a defined force of a given geometric presser foot. The depth of the indentation reflects the hardness of the material. A general distinction is made between static and dynamic methods. In traditional static tests, the test force is applied uniformly with increasing magnitude, while in dynamic testing methods, an instantaneous load is applied. From metal, plastic and rubber to foam and fabric, different materials are measured using different hardness scales, such as ASTM D2240 type A and type D scales. For example, soft plastics are measured using the type A scale, while hard plastics are measured using the type D scale. A number of hardness testing standards, hardness testing methods and hardness units exist, including the Rockwell scale (A, B, C, D, etc. ), the Brinnell scale (HB or BHN), the Leeb rebound hardness level (HL) and the Shore hardness scale (HS). Shore hardness, especially Shore A and Shore D, is commonly used for determining foam hardness, soft plastic hardness and rubber hardness, like in rubber o-ring testing. Because of the popularity of the Shore hardness method, a durometer is often referred to as a Shore durometer. Another test standard, the Vickers hardness value (HV), is commonly used in microhardness or microindentation hardness testing, as is the Knoop hardness test (HK). Microhardness testing is a method of determining material hardness when test samples are extremely small or thin, or when measuring small regions in a composite sample or plating. 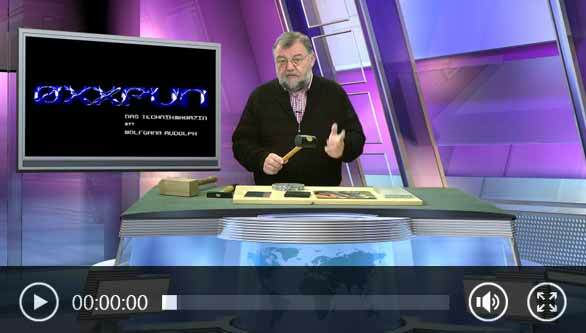 Video with Wolfgang Rudolph: What is hardness? What is a durometer used for? A handheld durometer is especially practical in areas of production, quality control and technical service due to its portability and compact, ergonomic design. Depending on the type, a handheld digital durometer can be equipped with an LCD display, a 360° dial, internal memory and/or a USB interface for data transfer. Another advantage of a digital durometer is an internal rechargeable battery, like the one found in model PCE-1000. A durometer with integrated refraction impact takes measurements without the use of cables. With this kind of durometer, you can take the same measurements with the minimum amount of force but with the same level of accuracy. The Metal Hardness Testing Durometer PCE-2600N is used wherever a fast hardness test has to be carried out. 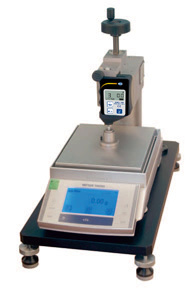 It is possible to use the durometer PCE-2600N to determine the surface hardness of many metals. The durometer PCE-2600N is especially suitable for quality or product inspection. The Metal Hardness Testing Durometer PCE-2600N-ICA is used wherever a fast hardness test has to be carried out. It is possible to use the durometer PCE-2600N-ICA to determine the surface hardness of many metals. The durometer PCE-2600N-ICA is especially suitable for quality or product inspection. The durometer PCE-2900 has been developed for hardness measurements on metallic materials. The durometer PCE-2900 measures the material hardness in Vickers, Brinell, Rockwell, Leeb and Shore. The durometer PCE-2900 measures the hardness according to the Leeb rebound principle. The PCE-DD-A durometer is used to measure Shore A hardness in soft gums, rubber, elastomers and more. This compact pocket sized tester is ideal for checking / testing rubber hardness (tyre condition checker). Calibration is not available for this item. PCE-DD-D is a Shore D durometer or hardness tester. This Shore D durometer uses an impact rod with a 30º conical point and 50 Newtons (N) of force to make a surface indentation on material samples with a minimum thickness of 6 mm or 0.24". Calibration is not available for this item. 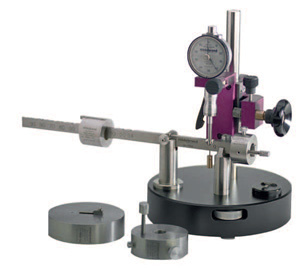 Mechanical shore durometer for measuring hardness of soft elastomer with drag needle. The shore durometer is composed of a single component with a measuring head and a 360º dial. To improve the readability of peak value, the device comes with a drag needle, that ensures the maximum reading can be captured. Once it has been measured, it can be reset to zero. The PCE-DDD 10 Shore D durometer is a portable handheld device used to check Shore D hardness in hard rubber and thermoplastic. This digital durometer has a reading accuracy of 0.1 hardness units. The durometer comes manufacturer calibrated and can be optionally certified to ISO standards for an additional fee (see accessories for details). The PCE-DDO 10 shore durometer is an ergonomic device to check Shore hardness in gum. It has been designed with a high quality. The PCE-DDO 10 durometer is mainly used for soft gums. If the material thickness is not enough, it should be tightened on the back with the same material in order to increase its thickness. The PCE-HT-75 durometer for concrete is easy to use and is fundamentally used in the construction industry as well as other industrial sectors (testing for Wickel hardness of rolls in commodities). This durometer in the form of a hammer device for testing concrete is based on the Swiss principle of measurement. The PCE-DDD 10 shore durometer is an ergonomic device to check Shore D hardness in materials such as hard rubber and thermoplastic. It has been designed with a very high quality. PCE-1000N is a portable handheld Barcol hardness testing durometer used to measure the hardness of pure aluminum, soft aluminum, thick aluminum alloy and aluminum sheets, strips, rods, castings and forgings. The hardness of fiber-reinforced (FRP) plastics, glass-reinforced (GRP) plastics, hard plastics and soft metals (such as copper or lead) also can be tested using this battery-powered digital Barcol impressor hardness meter. The Leeb Metal Hardness Testing Durometer PCE-900 measures the hardness of nine different metals using the Leeb rebound method. This means that with the metal hardness testing durometer a firing pin bounces on a metallic surface and the intensity of the rebound is used as an indicator of the material hardness. The Metal Hardness Testing PCE-900 measures the metal hardness in 5 different hardness scales. PCE-950 is a handheld metal hardness durometer used to determine the hardness of 10 different types of metal (i.e., cast steel, hammered steel, cold-rolled steel, stainless steel, cast iron, ductile iron, aluminum alloy, brass, bronze and forged copper alloy) according to the Leeb rebound method. In addition to Leeb hardness units, the metal hardness tester displays hardness measurements in Rockwell C, Rockwell B, Rockwell A, Brinell, Vickers and Shore hardness units. The PCE Instruments PCE-2000N durometer uses the Leeb rebound method. This is a dynamic hardness test method in which a standardized test specimen, usually a hard metal ball, is hit with defined impact energy on a test surface. Calibration is the control of measurement magnitudes correction for a measuring instrument without intervention in the measurement system, or the determination of the systematic display deviation in relation to the real value of the measuring magnitude. A calibration certificate is a document that confirms that the technical properties of test instruments comply with a recognized standard of measurement. The introduction of International Standards Organization (ISO) 9000 brought about new requirements for quality control. As a result, many companies and laboratories must obtain ISO calibration certificates for their measuring instruments. An ISO calibration certificate is a controlled document that confirms that the specific test instruments meet the minimum requirements of the appropriate ISO standard. An ISO calibration certificate can be acquired for any shore durometer offered by PCE Instruments. PCE Instruments’ friendly and knowledgeable technical experts are available to answer any questions related to the process of establishing a calibration interval. However, as a guideline for best practice, PCE Instruments recommends a calibration interval between 1 and 3 years. How accurate are your test instruments? 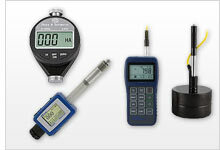 PCE Instruments is a trusted manufacturer and supplier of accurate, reliable shore durometer products. Each test instrument is calibrated and adjusted according to the highest possible quality standards by PCE Instruments itself, or by a first-class calibration laboratory partner.